A new hominid skull find is making news today. The headlines are predictable over-dramatic but the skull nonetheless is quite impressive in its state of preservation. I don’t have time for a detailed report of this find but I have read the paper (Lordkipanize et al. 2013 see references) and several other papers about this particular archaeological site, published in the last 10 years, and this skull has some interesting history that I thought I would share. Hopefully it provides some context for the news that most of you have either heard or will hear soon. This post follows from a series of posts in which we have been looking at the geological context of hominid fossils including: The Frequently Overlooked Geological Context of Hominid Fossils, Geological Context II: Neanderthals and the Italian Supervolcano, and Context is Key for Interpreting Large Fossil Find in Spain. First I would like to point out that although news headlines like to point out that this is a new find, the skull was actually found sometime before 2005. So if this skull is so amazing why has it taken more than 8 years to reveal its existence? This really is not as unusual as it might sound. The skull was found in 2005 but I would not be surprised if it has taken many years to extract it from the rock it is embedded. The process of extracting fossils of such importance is painstakingly slow and then the analysis of the bones takes a very long time. What you may not know is that this site has already yielded four other skulls from the same layers of rock though none of them were as complete as this one. The investigators have probably known the significance of this particular skull for many years but because they know that everything they report will be scrutinized to the nth degree they have to be absolutely sure they have their data right. To the left is the new skull that has just been described. You can see here that the extraction of these from the rock is no easy task. It might have taken a year to go from the image above to what you can see in this image. This skull is just the latest report in a long line of papers spanning more than 10 years that have detailed other discoveries at this location in Georgia (the country not the state). In multiple vertical pits more than 2000 bones of extinct mammals (rhinos, saber-tooth cats, hyenas etc..) have been reported and the geological history of the site has been explored in great depth. Over 1000 primitive stone artifacts have been found along with four other partial archaic human skulls and many other human remains. 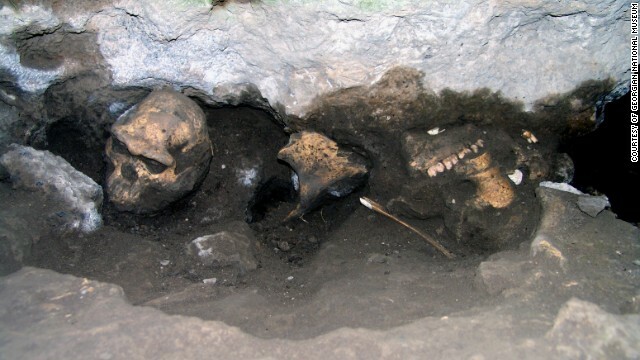 A hominid and other extinct mammal remains were found during a 1984 archaeological dig of a medieval storage pit in a complex of medieval defensive structures found on a point overlooking the confluence of two rivers. In 1991 the first report of human remains from deposits underneath this storage pit. Later it was found that these deposits were far older than the medieval time period and were rather in layers of rock that where likely more than 1 million years old. So this was a fortuitous and accidental find. Archaeologists studying the remains of human occupations only 1000 years ago stumbled onto evidence of an occupation of the very same location by a distinctly different group of hominids in the past. Since the mid-90s paleontologists have been methodically digging pits in several spots in this area and have now dug down 15 to 20 feet to where the deposits meet a thick layer of basalt (hardened lava) which lies under this whole region. What they have found is that the hominid remains and stone tools are in the first foot to 10 feet above the basalt rock and then there is a layer of rock and sediment that lies above those artifacts. On top of all of these deposits lays the foundation of “modern” occupations of the site that have persisted over 1500 years including stone structures from the medieval period. Figure 2 from Gabunia et al. 2000 in Science. (see references) . Human stone tool artifacts have been found all the down at the bottom of the pit pictured to the right. Figure legend from that paper: Stratigraphy and archaeological discoveries in Unit M5. 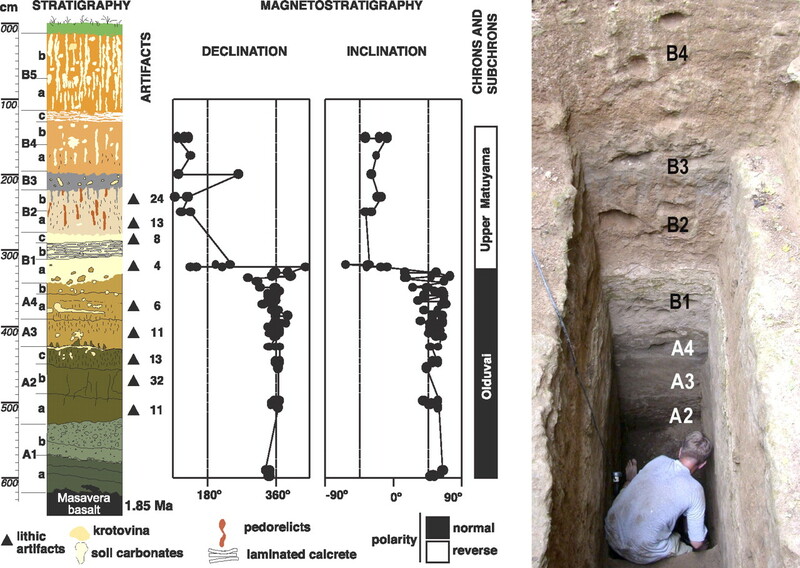 The 6.2-m section shows that Dmanisi’s sedimentary/geomagnetic record spans the late Olduvai subchron (stratum A) through earliest Upper Matuyama chron (stratum B). Test excavations recovered 73 stone artifacts from strata A2–A4, which are firmly dated to 1.85–1.78 Ma. A possible history of this site based on the analysis of the sediments. The location of these hominid fossils presents what sounds like a great mystery. How did these artifacts become buried in deposits nearly 20 feet below the present ground surface? I believe is the most challenging aspect of this find for young earth creationists and just about for anyone who is involved in evangelical discussions about human origins. I have said many times before that context is crucial to understanding the challenge of human fossils. Stripped of their geological context almost any interpretation of human origins can be proposed but the geological context provides a framework that can be used to test the validity or likelihood of a particular hypothesis. The location of these fossils sits between two deep gorges on either side of the medieval ruins. The rocks at the top of the valley walls is from lava flows. There are modern (ie. <10,000 year old) occupation site remains in the valleys and the hills attesting to the fact that this area has looked much as it does today for as long as modern people have been around. The two gorges are formed by the erosion by rivers through a thick layer of basalt. This thick layer of basalt is underneath this whole region and represents a lava flow that filled an ancient valley. Right on top of that lava flow are layers of soils that are mixed with volcanic ash suggesting that volcanism in the area continued for some time and laid down ash over the basalt. At some point a grassy covering developed which was then inundated periodically depositing more soil. After several meters of deposits built up and hardened subsurface water apparently created series of caves. It is in the deposits into these caves that most of the stone tools, human and other mammal bones are found. But these caves were not large enough for people. Either bones and tools got washed into these caves by small floods or carnivores could have pulled their prey into the caves. On top of these deposits including the in-filled caves are many layers of deposits that have no artifacts until your reach the very top layer where modern artifacts are suddenly found. The roof in the foreground covers one of the main excavation pits. 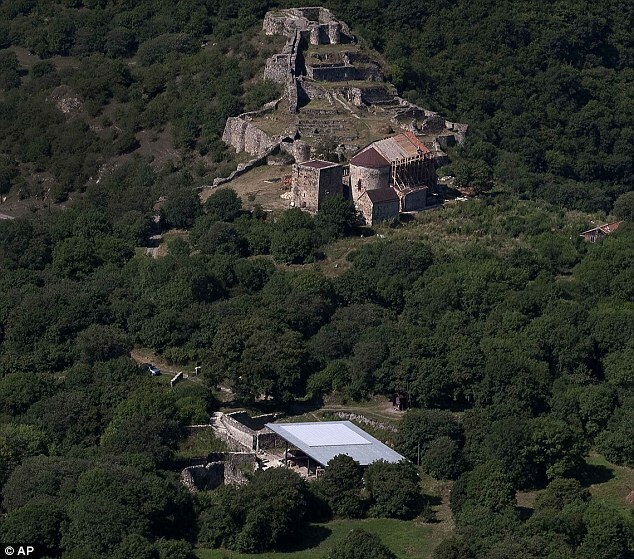 You can see here that the ruins are built on the rocky highland between the two rivers. The fossils are found in these rocks. You might look at the picture of this site and ask yourself; but how could 15 to 20 feet of sediments get deposited on top of this basalt layer and bury the evidence of past occupation when the place that this excavation is taking place is nearly the highest point in the area? Yes, today it is the highest point and erosion is happening NOT deposition. The most likely answer is that in the past this was not the highest point but rather it was probably about even with the land around and there were no canyons present. It was at that time that this site was first occupied and there was deposition in the whole area of sediments onto the basalt from higher ground. Only after 20 feet or more of material was deposited did some streams start to cut down into those sediments on either side of the site and eventually cut through the basalt to form the 80-meter deep canyons that we see today. Since the time the canyons began to form no more deposition would have occurred at the site we are interested in but rather erosion would be the only activity. By the time medieval residents built on this site many feet of deposits may have already eroded and the ground they built on was very old. Dating of the sediments here suggest that most of the rocks are more than 1 million years old and so erosion of this area has been occurring for a long time. Given the characteristics of the rock and sediment layers underlying this medieval settlement the following general scenario can be reconstructed concerning the history of this site. 1) There was a shallow valley in this region which was filled with lava from a local volcanic eruption. This left a huge area covered with black basalt which was then covered by layers of ash from continued eruptions. 2) Over many 10s of thousands of years this basalt field and ash was converted into a savanna grassland with small streams and wetlands (the fossil bones and plant material is evidence of this). Floods and period volcanism added new layers of soil to the particular spot where this archaeological dig is today eventually accumulating up to 10 feet of more of sediments. After this small caves formed in these deposits and possible sinkholes were formed at the surface. During this time ancient humans lived in this area and were involved in hunting and gathering activities leaving the hundreds of stone implements which have been found in just the few trenches that have been excavated so far! Artifacts and bones could have washed into the sinkholes/caves or been pulled there by carnivores though bones with clear marks of carnivory have yet to be found. 3) The sediment/rock column above the basalts suggest that at the time of cave formation there was a period of some erosion at this location but then new deposits were added on top of the filled caves to bring the total depth of deposits of 20 feet or more above the basalt rock layer. At some point, likely well after all these human remains and stone artifacts were deposited, the rivers on each side of this location began to incise down through the basalt layer to form the deep canyons you see today on each side of where the ruins are perched. Since this time, probably hundreds of thousands of years ago, only erosion has been taken place at this site. 4) By 6000 years ago modern humans were living in this area and left signs of their presence in the canyon which is why we can say that the canyons have been there a long time and that the rock on top of the basalts must have been deposited prior to the canyon formation. Just a skull? What about the rest of the body? It isn’t just the skull that was found. There have been other scattered hominid bones found associated with the bones. It is clear these are not buried bodies but rather it is likely that these hominids were killed by saber toothed cats or another carnivore and brought here. The presence of other mammal bones with the human bones supports this conjecture but it is difficult to know exactly how these bones came to rest in this place. Three others that I know of, including a couple of YECs, have blogged on this story. Thanks for posting on this! I’ve been hearing/reading about it, and it was fascinating to learn about the geological history of the site. From MSNBC:” Putting together the pieces of a “1.8 million-year-old” skull from the country of Georgia has led researchers to a surprising conclusion: Specimens that supposedly represent several early human species might be merely different-sized individuals from the same species. Yes, I saw that article this morning. Not surprisingly the author avoids the geological context of the find other then suggesting that the remains were possible the result of a cave collapse. The deposits do seem to be from a former cave that filled or collapsed but the collapse didn’t case the people death since the heads are detached from the rest of the body and not many other hominid bones are found. The geological context is a bigger problem for young earth creationists than the actual skulls themselves. “with more morphological variation between them than between the various proposed species of Homo”. Where did you get that from? I’ve not read it anywhere. Is it in the Science paper (I’ve only been able to read the Abstract)? You will probably not be surprised to learn that he censored my post – see earlier comments for the context of this – and also totally ignored my question (even though he has added two postscripts to his article). The CMI article quotes Ann Gibbons as writing in Science: “The skulls were as variable as African fossils traditionally classified in three different species—H. erectus, H. habilis, and H. rudolfensis”. The article does not repeat Coppedge’s phrase. Not sure that the points is that important. His paraphrase is just that, a paraphrase. Could have been better but not all that critical. Donald Johanson is quoted as saying that the “entire collection of specimens of early Homo species from East Africa shows “considerably more variation than you see in this sample [from Dmanisi], which is not surprising, because you’re looking at fossils from very different regions”. True, but it doesn’t mean that Dmanisi skull don’t show remarkable variation. I think the storyline is a legitimate one that some named species are probalby just variations within a species. Really quite interesting. EvoAnth Benton has also now blogged on the story.